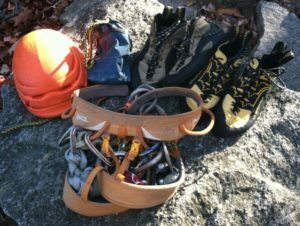 In the time I have spent rock climbing, I have really loved going to crags that rely on the use of traditional gear. What I love most is the type of terrain and the areas that can be visited. You can challenge yourself on hardstuff or climb really fun, longer, moderate terrain too. Multi-pitching allows you to get higher off the ground, giving a greater feeling of exposure. It usually involves climbing with a partner, and you can develop strong bonds with those you share a rope with. Crack climbing has been my favorite traditional pursuit. I love the art of jamming! Cracks form striking natural features that catch the eye first. It’s an obvious path to the top, and they usually protect really well. 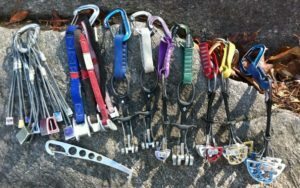 Trad climbing is gear intensive, requires a higher level of technical skill, and is a more thoughtful type of climbing. 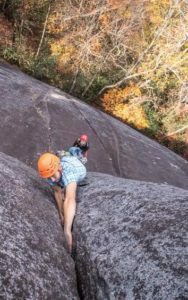 These places are rich with climbing history, can feel more adventurous, bold, and at times (especially on slabs, or here in North Carolina) downright scary. I recommend getting guidebooks because they are a great source for this information. They can be expensive, but they make a great souvenir, and help avoid unnecessary epics. I’ve learned that the hard way. At first this can all be overwhelming. Give it time and you will learn the tricks to solving the puzzle. I wish I had a better idea of what I needed starting out. I bought a lot of gear that I really don’t use much anymore. 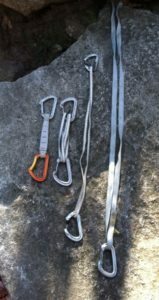 So, I have put together some beta on what I find useful for a day of traditional style cragging in a single pitch, or short multi-pitch environment. When climbing in these locations I typically pack pretty comfortably since there usually aren’t crazy long approaches. Besides, it’s good training weight for when you do tackle a larger objective! So go ahead, bring some extra gear, layers, water, etc. since you aren’t committing to a long route where being light and fast is advantageous. Having said that, I typically only bring what I need on the wall for a given route, and stash the rest at the base for when I am back down. This assumes you are rappelling back to the same spot though. Yup, learned that the hard way too. Helmet: No matter what, you will be safer by wearing a helmet. Gravity works! Rocks and gear can and do fall. Doesn’t it make sense to protect your squash?! I wear the Petzl Sirocco. It’s lightweight, breathes well, and I barely even notice I’m wearing it. Funny, considering it’s like wearing a traffic cone. -La Sportiva TC Pros: I really like these on routes involving slabs, edges, and cracks. When I bought them I was looking for an all day comfort shoe for long moderate routes. I went a ½ size down from my street shoes, and they have been great for their At times they can feel a little loose though. -La Sportiva Katanas: I recently bought a pair of these for technical performance, and I love them. I went down a size and half, and they fit like a glove! Awesome for edging, and the narrow profile of the toebox have made these excellent for crack climbing too! Chalk bag: I was recently converted from attaching this with a non-locker to a piece of cord. It keeps it higher on your waist, and it is more mobile. I saw it benefit the first day as I was climbing a chimney! Approach shoes: I love having a good pair of approach shoes. They are great for inspiring confidence scrambling up to or walking off a route. There are many styles, and like rock shoes they are designed for different uses. Some shoes are best for trails in the woods. Others are high end technical shoes great for long days on low 5th class rock. My favorite have been the Sportiva Gandas. If you find a pair of these in your size, I highly recommend getting them since they are no longer made. If you know anyone getting rid of a size 12, let me know! Pack: I like having a medium (30-35L) sized bag. This allows me to fit all my equipment plus a couple extra layers, water, and food. When buying a new bag try to bring everything you are planning to pack. Make sure it fits, and more importantly that the pack will be comfortable! I am currently using the Deuter Guide Lite 32+. Dynamic climbing rope: (9-10.2 mm) There’s something to be said about a beefy workhorse: they are typically more resilient. Don’t be so fast to run out and by the newest shoelace size rope as you are learning. Also, stick to using a single rated rope. Sometimes you will need two ropes if a route requires long rappels (more than half a rope length). I personally like marking the middle of my rope. 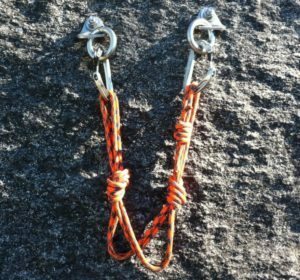 This makes setting up single rope rappels much easier, and ensures that the ends are even. Make sure to tie knots in the ends while you’re at it too. Rappelling is the number one cause of climbing accidents. Don’t rappel off the end of your rope! At FMG, all of the guides use a range of Bluewater ropes for both guiding and personal climbing. Standard Rack: In guidebooks you may often see the term “single rack.” That refers to bringing one of each size in the standard camming range (.3-3), some stoppers, and draws. 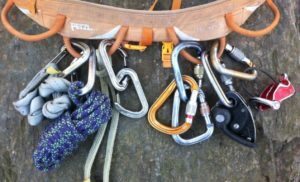 Some routes can call for more specific gear like doubles, big cams (4-6), small cams (.1-.2), extra wires (stoppers), or long slings. A good rack is made up of an assortment of both passive and active gear. I include stoppers, tri-cams, cams, draws, and anchor material. – A nut tool is useful as well! Tri-cams (by Camp): In my opinion pink, red, and brown are most useful (I also carry black and blue). Check out the evo’s; they have a more sturdy sling so they are easier to place, and the head is tapered allowing it to be placed passively on its transverse They are nice to use in anchors to save cams for the next pitch, and I find they are great for the funky spots where other gear doesn’t quite work. Patience is the key to removing them though because that same funk lends itself to easily getting stuck. Cams: I have found it useful to combine brands when building a rack because each style is slightly different. The style’s ranges aren’t exactly the same, and the unique head/stem designs cause them to fit in the rock I use racking biners for each cam to help keep my harness organized, for ease of placement, and to provide the ability to clip it direct. Draws: Typically when I go out climbing I bring around 10 draws. This is usually a combination of quick draws, and alpine draws. These can also be known as extendables, runners, or slings. I may not always carry this many on me while climbing, but it allows me to decide what I need for a given route. Extendables are a great way to help manage rope drag on wandering pitches. Be aware though that each time you extend a draw you are also increasing the distance of a potential lead fall. Anchor material: It’s important to bring enough anchor material for your given I usually bring two extra lockers (for TR), an extra cordellette (25 ft, 7mm nylon), and my microquad! Microquad: This is my go to for a fast and strong anchor on bolts! Leave it tied, and enjoy the efficiency. Awesome to have on multiple rappel transitions. I made mine with a 12ft loop of Sterling power cord. Remember, clip 2 or 3, not 1 or 4 (strands). Saved me a lot of unnecessary weight (and money) for my rack.